If you use a higher count fabric than 24 you will probably need to use a thread more slender than a size 5. 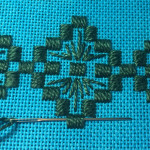 Most of my Hardanger projects are worked on 22-24 count evenweave fabric using DMC pearl and Anchor perle in thread weight size 5 and size 8. Though in more limited colors than the size 5 and size 8 these threads are also available in the thicker weight size 3 and thinner weight size 12 thread. All of these mentioned threads are single stranded. Hardanger buttonhole stitched edge: You need to ensure that the size thread you select for the buttonhole stitch edge is of the thickness to help bind the fabric thread so that the buttonhole edge does not unravel when excess exterior fabric is trimmed away. I used the size 5. When stitching you want to use a length of stitching thread that is comfortable to you. I find 20-22-inches to be about the max length as the cotton thread begins to wear and fray from the friction of going through the fabric. I also like to use Caron over-dyed threads from their Wildflower collection. This is a single strand hand-dyed cotton in variegated colors. It has more of a matte finish then the pearl and perle threads. Single stranded, this thread is between a size #8 and #12 in weight. Here in the USA, DMC pearl (size 5) is readily available with several companies offering over-dyed specialty colors. Remember the dark color threads and especially the over-dyed ones may not be completely colorfast. I suggest taking a sample (few inches of thread) thoroughly wetting it and blotting the on a light color paper towel or a throw away piece of fabric. I finished an embroidery piece, was at the stage of a light spraying of starch across the back and ironing. As I ironed I noticed the dark blue flowers were developing a blue ring around them on the white fabric! All those hours of work and cost of material went into the trash just because I didn’t do the step of checking the thread’s colorfastness before using it. By the way, the thread wasn’t Anchor, DMC or Caron … you can imagine how quickly I went through my stash of and placed all of the threads from THAT! company into a plastic bag and stored them aside from the others. I greatly enjoy the color range of the Anchor threads and quite sad to learn that the company is no longer producing threads. For the last few years Anchor has still be available within the USA and most stores are offering it at a discounted price in order to sell off their inventory. 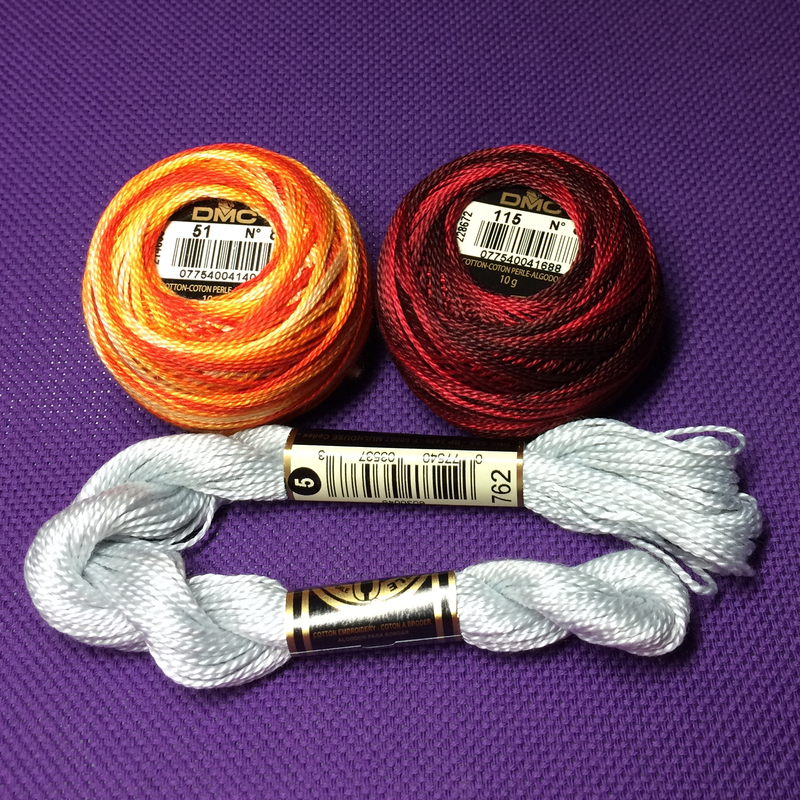 The DMC pearl and Anchor perle cotton threads are mercerized. The mercerized process applies chemicals to the thread that gives the thread a sheen. Some fabrics have a coarse or roughness to the fabric thread which can wear your stitching thread, making the stitching thread look dull and tired out. If the stitching thread starts to have a worn look to it I would start up with a length of fresh stitching thread. If you are not sure that a fabric or stitching thread is colorfast my suggestion is to test before use. My color fastness horror occurred when I had used a dark blue variegated thread on natural linen, finished the project, and while ironing used spray starch. Immediately I started to see a blue halo creeping out around the blue worked flowers of the design. Lesson learned (by me). I now check colorfastness before I began a project. As shown in the above photo Anchor and DMC have paper bands around the skeins and labels on their balls of thread. These bands and labels state the manufacturer, normally contains country of origin along with color number, yard length within the skein, etc.. I make sure I keep the paper bands and labels on the skein or ball so I especially know the color number, manufacturer, and dye lot. DMC divisible 100% cotton six-strand floss is 8.7 yards per skein. Anchor divisible 100% cotton six-strand floss is 8.75 yards per skein. 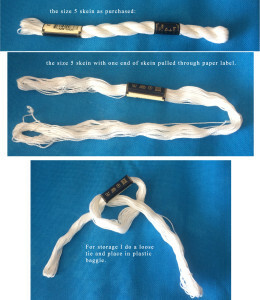 Do not just dive into pulling thread out of a skein: Strong caution here, though I know several friends who leave their thread as is in the skein and pull out the length they need …. I don’t. 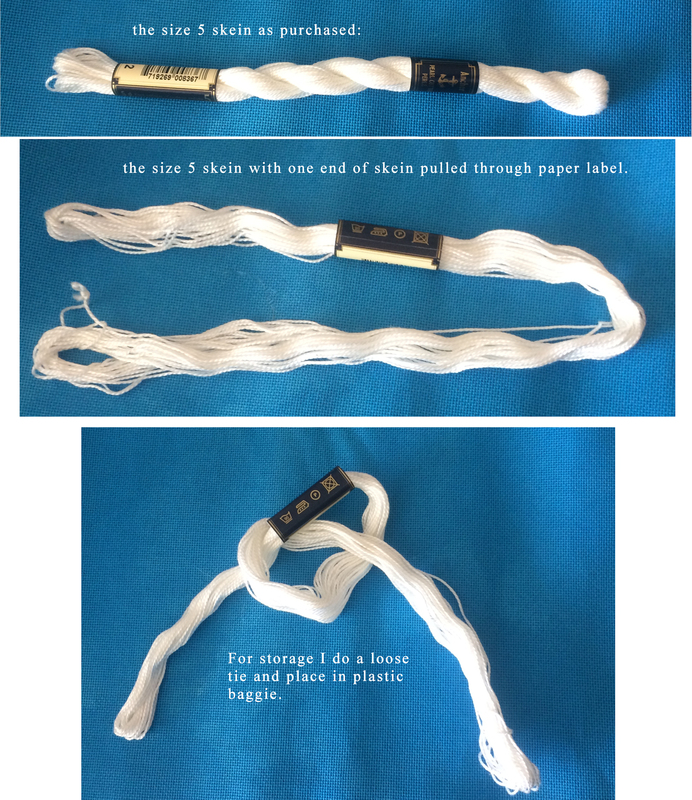 I’ve gotten into jumbled tangles several times doing this pull out the length … I now open the skein up like shown in the top two photos to the left and store the opened skein with a loose knot. The soft, large knot within the open skein helps to keep the paper label with its skein. The DCM pearl and Anchor perle threads are s-twisted and do have a sheen to them. There is no set rule but when I open a new skein I snip it such that one end retains the knot. I thread the needle with the free end thread of the skein then the length is cut. With this method I feel that it helps to provide a uniform look to the thread’s sheen. 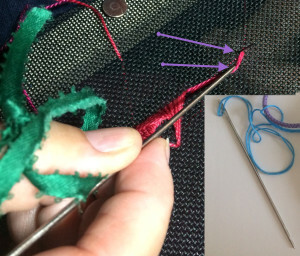 My go to website for learning about s-twisted, z-twisted (rayon thread used in Brazilian embroidery), different threads, opening a skein, etc.. has been Mary Corbet’s http://www.needlenthread.com/. She near daily adds to her blog and has a good search box for asking questions like ‘thread sheen’, ‘opening a skein’ and so on. When working with size 5 and 8 threads I like to use a size 22 or size 24 tapestry needle. The eye is large, the shaft of the needle is thick, and the tip is blunt. The long eye of a tapestry needle makes it easy to thread and it momentarily enlarges the fabric hole as the needle passes through, thereby reducing thread wear and fatigue.In hardanger embroidery you do not want to pierce a fabric thread or stitching thread with the needle. The blunt tip of a tapestry needle helps me by moving the fabric and stitch thread aside. 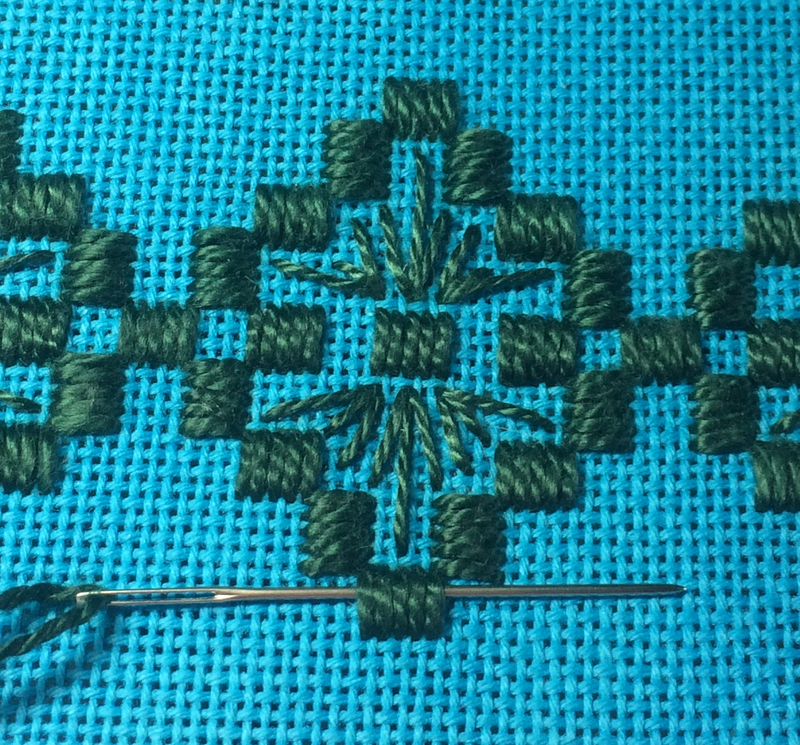 if you prefer a sharper needle, consider a chenille needle. This seldom has happened to me, but needles do break, they bend, and some have a roughness to them. I keep an empty glass spice bottle with a screw-on top near my work area. If a needle breaks or becomes a problem (fraying the thread, hurting my fingers), it is discarded into the glass bottle. Another needle that I use quite often is a 6-inch blunt ended darning needle. In this photo I show two views.The photo on the left shows how I use the blunt end to move aside stitched threads (see the two purple arrows) when I am underneath, bringing up a needle into a specific fabric hole like in this photo where I am working a Rhodes Stitch. The other view on the right side of this photo is to give you an idea of the large eye and eye length.